This 65th annual summer music camp directory published by The Instrumentalist includes programs for students and teachers. Programs for directors are marked with a D Student camps are marked as S . Camps are divided geographically into eastern, central, and western divisions. Directors may make up to 100 copies of this listing for distribution at no cost to students, parents, or teachers. ©2011 The Instrumentalist Publishing Co.
Click on a state or country. Instrumental Tech­niques is for instrumental, vocal, and general music teachers at all levels who wish to improve their musicianship skills for teaching; emphasis is on beginning instrumental study for recorder, winds, percussion, and strings using the newly revised edition of Jump Right In: The In­stru­mental Series, Books/ CDs 1 and 2. Tuition with housing $1,415 noncredit, $4,165/three credits; tuition alone $700 noncredit, $3,450/three credits. 7/18-29. 10 participants, 1 teacher. Contact: 585-274-1027, [email protected] .rochester.edu. Dalcroze Eurhythmics Pedagogy for Teachers, for music teachers and performers, makes music concepts physical through rhythmic kinetic exercises. The course includes Dalcroze solfege, improv­iza­tion, philosophy, and pedagogy. Partici­pants enhance their own skills, discover new insights into the relationship of music and movement, and learn how to develop activities and teaching strategies for students at various levels. Tuition with housing $690 noncredit, $1,410/one credit; tuition alone $430 noncredit, $1,150/ one credit. 7/11-15. 6 participants, 1 tea­cher. Con­tact: 800-246-4706, summer @esm.rochester.edu. S Eastman School of Music Summer Pro­grams, Rochester. Summer Jazz Studies is an intensive, performance-based experience for students currently in grades 9-12, especially those considering collegiate jazz studies. Students work with the Eastman jazz faculty during the rigorous two-week session designed to enhance improvisational and ensemble skills. Tuition with housing $1,945, tuition alone $1,150. 6/26-7/8. 50 students, 12 teachers. Trumpet Institute taught by James Thompson, Doug Prosser, and Wes Nance. Master­classes, mock auditions, daily group warm-up sessions using buzzing techniques, and ensemble playing. Special attention will be given to preparation for college and orchestral auditions, and individual exit interviews will help students evaluate how their current level compares to their ultimate goals. Tuition with housing $1,475/1 credit, $865 noncredit; tui­tion alone $1,150/1 credit, $540 noncredit. 7/31-8/4. 15 students, 3 teachers. Trombone In­stitute with Mark Kellogg, Jim Martin, Lisa Albrecht, John Marcellus, and Catie Hickey. An intensive workshop designed for players of high school age and above. Includes daily masterclasses, trombone trio or quartet coachings, and trombone choir rehearsals. Each student receives one 60-minute lesson during the session. Rotating throughout the week will be sessions on solo playing, orchestral playing, audition and recital preparation, improvisation, and doubling. Tuition with housing $1,475/1 credit, $885 noncredit; tuition alone $1,150/1 credit, $560 noncredit. 7/31-8/5. 24 students, 5 teachers. Viola Work­shop with George Taylor and Katie Dey offers an intensive exploration of fundamental instrumental techniques and musical interpretation skills. Suitable for advanced high school students, conservatory musicians, and seasoned professionals. Tuition with housing $1,605/1 credit, $1,130 noncredit; tuition alone $1,150/1 credit, $675 noncredit. 6/26-7/3. 20 students, 2 teachers. Percussion Institute with Michael Burritt, Lee Vinson, Bill Cahn, and John Beck. Consists of daily masterclasses and lectures focused on topics such as musicianship, technique, interpretation, expression, performance anxiety, composing, choosing repertoire, physical awareness, listening sessions, and pedagogy. Classes include classical percussion, world music, and drum set. Tuition with housing $1,475/1 credit, $885 noncredit; tuition alone $1,150/1 credit, $560 noncredit. 6/26-7/1. 20 students, 4 teachers. Saxophone Institute is a five-day intensive program hosted Professor Chien-Kwan Lin of the Eastman saxophone studio. High school and college students receive personal, in-depth instruction in all aspects of saxophone studies. Includes a private lesson with Lin, which is also offered in Mandarin-Chinese. Tuition with housing $1,540/1 credit, $965 noncredit; tuition alone $1,150/1 credit, $575 noncredit. 7/3-7/8. 15 students, 1 teacher. S FJM Clinics, Greensboro, offers all-inclusive program for color guard, dance teams, drum majors, student leaders, majorettes, and baton twirlers. Students gain strong technical skills, leadership skills, motivation and positive attitude tools, and teamwork experience in a professional, energetic atmosphere. Classes and sessions also available for directors. Private clinics can be scheduled at your school. Tuition with housing $290, tuition alone $200. 6/26-29. S George N. Parks Drum Major Academy, Kutztown and West Chester, offers exceptional workshops for drum majors, those who aspire to be a drum major, and band members who wish to im­prove their leadership skills and be a stronger asset to their band programs. 7/14-18. Contact: 781-874-9728, [email protected] Kutztown 7/9-12; West Chester 7/26-29. D Summertrios Regular Pro­gram Week One, Chambersburg, is a chamber music program for adult amateurs. Debussy, Brahms, Shostakovich, Haydn and Mozart string quartets; pianists choose their repertoire. Program for novice string players includes sightreading classes. 60 participants, 14 teachers. Summertrios Regular Program Week Two is a week-long chamber music program for adult amateur musicians; strings, piano, and woodwinds. For both sessions an effort is made to arrange compatible peer group schedules that address each person’s individual needs. Performance is optional. Private lessons are available. Enriched program available – six extra hours playing with professionals only. 45 participants, 20 teachers. Tuition with housing $1,100 each session, tuition alone $1,025 each session. Week One 6/19-26; Week Two 6/26-7/3. D S VanderCook College of Music, Chicago. MECA (Music Education Center of America) Continuing Education program offers music educators practical and hands-on graduate-level courses taught by nationally renowned instructors. Credits earned can apply towards teacher recertification or as electives toward VanderCook’s master’s degree program. 12 MECA credit hours may be applied to VanderCook’s M.M.Ed degree, which can be completed over three summers. Anyone with a bachelor’s degree in music may register. Summer 2011 will feature over 30 one-week courses, including topics such as computers and technology, Orff certification, rehearsal techniques, repertoire, and instrument repair. Most classes are three graduate credit hours. Tuition alone $250-$280/credit hour. 6/13-8/5. Contact: 312-225-6288, [email protected] cook.edu. D S Amy Porter’s Anatomy of Sound, Work­shop for Flutists, Ann Arbor, includes masterclasses and in-depth discussions about the study of flute tone, breathing, and body awareness in both flute practice and performance for flutists ages 18 and older. Students, amateurs, semi-professional, and professional players are encouraged to apply. Fifteen performers will be selected by taped audition. Tuition alone $425/performers, $400/participants. 6/4-7. 40 students, 5 teachers. Contact: 734-764-5429. This is a teaching workshop for instrumental music educators and conductors of all levels, K-12 through university, at the University of Michigan. Sessions in­clude conducting, marching band, re­hearsal techniques, jazz ensemble, repertoire, and curriculum in beginning, middle, and high school band pedagogy. Tuition alone $450. 6/19-24. The Advanced Conducting Track is open to six conductors selected by videotape audition. 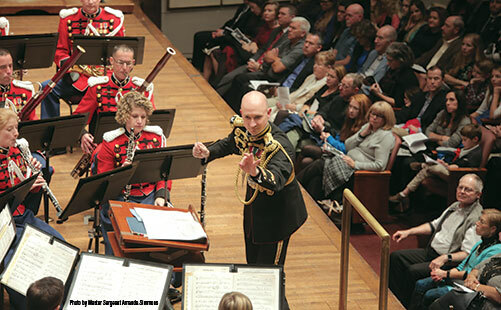 Selected conductors are given the opportunity to conduct a professional chamber wind ensemble for 40 minutes each day. The Conducting Track is de­signed for anyone interested in improving their conducting and teaching skills. Participants will conduct the Symposium Wind Band each day; these six sessions will total 50 minutes of podium time. This is a graduate-level course for current music educators and may be taken for credit as a noncandidate for degree status. Tuition alone $580. 6/19-24. D Central Michigan University Three Summer Master’s Degree, Mount Pleasant, offers degrees in music education and choral or wind conducting. There are one-week, two-week, and six-week courses for in-service music teachers working toward certification renewal or on a degree program. Jazz Band Pedagogy, 6/11-17. Inclusion in Music and Analytical Styles I, June 13-23. Curriculum Design in Music Education, 6/27-8/4. Choral Masterworks 6/11-21. D The Art of Wind Band Teaching Sym­pos­ium, Minneapolis. The symposium features nationally recognized artists, master teachers, and music educators for a week of workshops, discussions, and rehearsals at the University of Minnesota School of Music. Presenters include Michael Colgrass, Thomas Duffy, Craig Kirchhoff, Libby Larsen, and James Cochran. Wind conducting and rehearsal techniques, score study, wind band repertoire for all levels, advocacy for music education. Tuition with housing $750, tuition alone $425. 7/24-28. Contact: 612-624-6873. S St. Olaf Summer Music Camp, North­­field, is a one-week camp for high school students centered around the large ensemble experience (band, choir, orchestra) with additional enrichment classes and activities. Two private lessons are included in the camp tuition as well as room and board on campus. Chamber music, solo recitals, and social activities fill out the week, which culminates in a final day of chamber recitals and a large concert featuring the camp band, choir, and orchestra. Tuition with housing and meals $565. 6/19-25. 200 students, 35 tea­chers. S University of Missouri Kansas City Cello Days draws cellists from across the country and around the world for a challenging, fun musical experience. Features include world-class faculty, small-ensemble performance opportunities, cello choir, one-on-one instruction, daily masterclasses, and evening concerts featuring a variety of musical styles. High school and middle school divisions. Tuition with housing $625, tuition alone $450. 6/19-24. 20-25 students, 4 teachers. UMKC Jazz Camp brings world-renowned performers and jazz educators to Kansas City to work with talented young instrumentalists and vocalists ages 14-20. Faculty and distinguished clinicians provide insight and inspiration to student combos in a welcoming yet challenging environment. Highlights include combo rehearsals, coaching sessions, daily masterclasses, theory and improvisation classes, and faculty performances. Tuition with housing $460 until 4/13, then $490; tuition alone $320 until 4/13, then $350. 6/26-30. 45-50 students, 9 faculty. S Schoolhouse Fiddle Camp for Beginners, Avoca, is led by Deborah Green­blatt, championship fiddler and author of many fiddle collections. The course of study is designed specifically for each camper. Tuition alone $200. 6/13-17. 10 students, 1 teacher. D S International Music Camp Summer School of Fine Arts, Dunseith, was founded in 1956 and offers fine arts education programs for students of all ages. The program includes band, orchestra, choir, jazz, world percussion, garage band, guitar, fiddling, mallet percussion, musical theatre, total percussion, piano, a cappella pop choir, dance, and a university preparatory program. One-week camp sessions draw over 2,000 campers each summer from the United States, Canada, and many other countries. Tuition with housing $355/week if registered before 5/1, $370 after 5/1. Six one-week sessions from 6/19-7/30. 350 students, 150 teachers. S Cleveland Institute of Music Summer Cham­­ber Music Program is for piano, string, and wind players ages 12-18 interested in exploring music outside of their solo venues. The program combines coachings, supervised rehearsals, ear training, Eurythmics, rehearsal techniques, public masterclasses, and a final performance. Tuition alone $875 plus $35 non-refundable application fee. 6/13-24. 26 students, 10 teachers. Summer Sonata is a two-week program for pianists, Junior Level (ages 10-12) and Senior Level (ages 13-18). It includes private lessons, participation in masterclasses led by CIM faculty and guest artists and supervised practice sessions. Group classes in music theory, ear-training, Eurhythmics, form and composition, and piano literature. Tuition alone $875 plus $35 non-refundable application fee. 6/20-7/1. 20 students, 18 teachers. D S Oberlin Flute Institute, Oberlin, is devoted to the development of flute playing skills through mas­ter­classes, lessons, and performance classes. Michel Debost and Kathleen Chastain, instructors. For high school and college students, teachers, and professionals. Tuition with housing $1,000, tuition only $550. 6/26-7/3. 28 students, 2 teachers. D Shell Lake Arts Center Weekend Music Workshops, Shell Lake. Big Band. Perform jazz ensemble big band under the guidance of our nationally recognized teaching-artist faculty. This workshop for adults is open to all levels of experience, from beginner to advanced. This workshop is for people who want to perfect their jazz skills or need to polish the dust off of their instrument. S University of Wisconsin-Green Bay Music Camps, Green Bay. Middle School Band, Orchestra, and Choral Camp is for students entering grades 6-9 for band and 7-9 for orchestra and choral. It offers two hours of option classes in addition to rehearsals, master classes, and sectionals. Students play a short placement audition upon arrival. Tuition with housing $495, tuition alone $249. 7/17-22. 200 students 20 teachers. Senior High Band, Orchestra, and Choral Camp is for students entering grades 9-12. Tuition with housing $495, tuition alone $249. 7/24-29. 200+ students, 20 teachers. Jazz on the Bay Music Camp is for instrumentalists and vocalists entering grades 8-12 and older. Students will play in jazz ensembles and combos or sing in a vocal jazz ensemble. Class options are recording technology and songwriting for voice and arranging. Tuition with housing $495, tuition alone $259. 6/26-30. 80 students, 6 teachers. D California State University Summer Arts, Fresno, has drawn college students and professionals from the United States and abroad for 26 years. Two two-week intensives provide 3-6 transferable undergraduate or graduate college credit. Courses include digital music composition and media; jazz improvisation; and international chamber music and third stream. Tuition with housing $2,114, tuition alone $1,302. Participants work one-on-one and in small groups with renowned teachers. S George N. Parks Drum Major Academy, Riverside, offers exceptional workshops for drum majors, those who aspire to be a drum major, and band members who wish to im­prove their leadership skills and be a stronger asset to their band programs. 7/21-25. Contact: 781-874-9728, [email protected] .org. S Music Academy of the West, Santa Bar­bara, is for talented students who are planning a career in music. The eight-week summer program for string, wind, brass, and percussion students in­cludes performance opportunities in solo and chamber recitals, orchestra concerts, and opera productions. Plan ahead; application deadline for summer 2012 is mid-January 2012. Academy Fellows receive a full scholarship for tuition, room, and board plus a stipend to defray travel-related expenses. 135 students, 69 faculty, visiting artists, and guest conductors. D S Stanford Jazz Workshop, Stan­ford is held on the beautiful campus of Stanford University and focuses on combo performance and improvisation. Its summer programs, Jazz Camp (for instrumentalists and vocalists ages 12-17) offers a fun, encouraging environment in which to become immersed in jazz improvisation. S Aspen Music Festival and School, Aspen, offers a summer of study, performances, solo opportunities, masterclasses, and coaching with artist/teachers for talented students anticipating a career in music. Plan ahead; application deadline for summer 2012 is January 2012. Full session: tuition with housing $6,300, tuition alone $3,100; 6/22-8/21. Half session: tuition with housing $4,000, tuition alone $2,000. Contact: 970-925-3254. S Flathead Lake Music Camp, Rollins, is a band and choir camp for students entering grades 10-12, and a band camp for students entering grades 7-9. Tuition with housing $395. 7/10-16 high school, 7/17-23 middle school. 60-100 students, 28 teachers. Contact: 406-212-3939, [email protected]camp.org. Woodwinds at Wallowa Lake is a week of intensive music instruction focused on woodwind chamber music. Artist faculty from the Oregon Symphony Orchestra plus additional quality professional musicians. First come, first served; middle school through high school. Camp in­cludes music theory, history and literature, eurythmics masterclasses, and mixed en­sembles. Tuition with housing $425. 7/24-30. 85 students, 12 teachers. S ArtsAbroad Prague Conservatory and European Tour, Prague, prepares high school juniors, seniors, or recent graduates for university music studies. Students take instrumental or voice lessons with conservatory staff and attend lectures in music history and basic theory. Participants attend concerts, including the Munich Opera Festival and the workshop is followed by a tour of musical sights in Central Europe. Tuition with housing $5,300. 6/18-7/14. 30 students. If your camp was not included in this listing, an addendum will be printed in the April issue. To submit information for a camp go to www.theinstrumentalist.com or call 888-446-6888.